COCHRAN, GA – T.J. Herndon of Atwood, TN drove the Race Tek/Dale’s Recycling Special to victory on Saturday in the 3rd Annual Durrence Layne Performance Parts Street Stock World Championship Race at Cochran Motor Speedway in Cochran, GA. Herndon took the lead from Ronnie Johnson of Chattanooga, TN on lap 23, and then went unchallenged in the second half of the race. Herndon and Johnson were teammates to make up a potent “Tennessee Trio” with Race Tek Race Cars of Trevant, TN for a one-two finish with Durrence Layne Chevrolet, Buick, GMC in Claxton, GA helping out with sponsorship on Johnson’s ride. Michael Stalnaker of Ocala, FL was third in the SRE Electrical Special. Tyler Love of Lancaster, SC stalled the Interstate Towing Special on lap 12, but restarted and took the green flag at the back of the pack. Love charged back through the field, and came home with a fourth-place finish. Wil Herington of Cochran, GA came back from an incident with Johnson on lap 34 that sent him to the back of the pack in the 20th spot for the restart. Herrington came charging back through the field in the remaining 16 laps of the race to finish fifth in the Childs Racing Special. Kyle Livingood of Bristol, GA took the sixth spot in the Real Tree Construction Special. 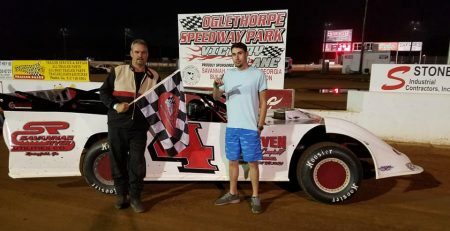 Spencer Hughes of Meridian, MS was seventh in the B.J.’s Tire and Service Center Special and Tyler Turvin of Ochlocknee, GA finished eighth in the T&S Steel Erectors Special. Jason Floyd of Cochran, GA started 23rd and finished ninth in the Floyd Racing Special, and Jason Price of Pelham, AL rounded out the top ten in the T&S Steel Erectors Special. 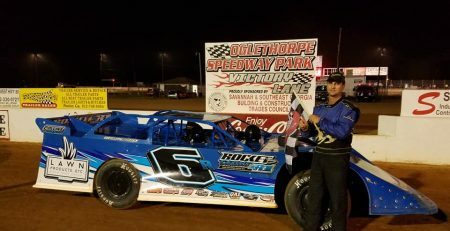 The VP Racing Lubricants Slick Move of the Race Award went to Justin McRee of Woodstock, AL, who dusted off the outside groove of Cochran Motor Speedway and came from ninth to third with some four-wide action early in the daytime race. J-Mac’s day was cut short when he dropped out of the race on lap 18 with ignition trouble in his High Roller Race Cars Special. 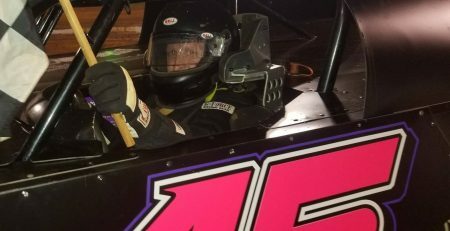 In preliminary on Friday night, Johnson was the fast qualifier among the 37 entrants, and 29 on the grounds for the event, made up after a rainout on December 28-29. 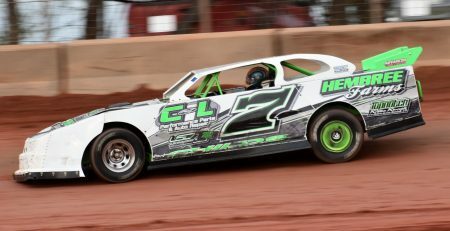 Johnson toured Cochran Motor Speedway in 17.576 seconds and won the first of three ten-lap Heat Races to earn the pole for Saturday’s 50-lap race. The second and third Heat Races were won by Herndon and Herrington. The 10-lap B-Main Race on Sunday was won by Chad Tuten of Patterson, GA in the Southeast Petroleum Special. The event had cautionitis for the first half of the race, as the caution flag was displayed early and often. Tuten spun in turn two on the first lap to necessitate a complete restart. On the next try to start the race, Johnson took the lead from the pole position followed by Herndon, Herrington, Love and Bryan Fortner of Millport, AL in the Race Tek/Dale’s Recycling Special. The second caution flag came out on lap three when Marty Reid of Clover, SC spun the South Forty Farms Special in turn two. Johnson had Herndon, Love, Fortner, Herrington, Hughes, Turvin, Stalnaker, McRee, and Livingood doubled up behind him in second through tenth respectively for the Dixie-Style Double-File Restart. When the green flag came out, Johnson had to fend off a challenge from his teammate Herndon, who was looking inside the leader, but couldn’t finish the pass. Johnson found a groove to his liking where he entered turns one and three on the high side, then, in the middle of the turns, he would dive for the bottom to come off turns two and four on the inside. That slowed Herndon’s momentum in making the pass. The top five was reshuffled on lap 12 when Love stalled on the backstretch to bring out the caution flag. The top ten for the double-file restart was Johnson, Herndon, Herrington, Fortner, Hughes, Stalnaker, McRee, Turvin, Ricky Greene of Inman, SC in the Harry Hodge Motorsports Special, and David Earl Gentry of Murfreesboro, TN in the RPI/Race Tek Special. The defending Durrence Layne Performance Parts Street Stock World Champion Johnny Stokes of Columbus, MS in the Durrence Layne Chevrolet, Buick, GMC Special tangled with Bud Chancey of Yulee, FL in the Chancey Industrial Special on the front straightaway on lap 13. Gentry pulled out of the top ten and into the pit area during the caution period. 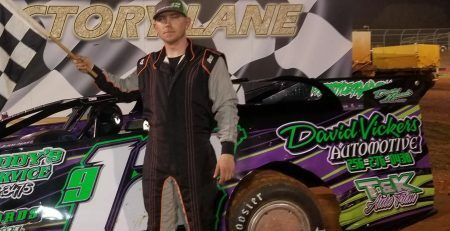 The Durrence Layne Performance Parts Street Stocks are well-known for two and three-wide racing on any type of surface, and they didn’t disappoint an appreciative crowd in the daytime at Cochran Motor Speedway. When the field went back to green flag racing, there multiple battles for position throughout the field with three, and even four-wide wars. Herndon, Herrington, and Fortner were battling three-wide for the second spot, as Johnson opened up a five car-length advantage over Herrington, who got by Herndon for second. Herrington and Herndon swapped the second spot three more times over the next nine laps. Fortner ran out of room on the outside and slid off the race track on lap 15 to light up the yellow caution bulb. That moved McRee up to fourth behind Johnson, Herndon, and Herrington. On lap 17, McRee drove by Herrington to take over the third spot. The caution flag was unfurled on lap 19 when Turvin and Price tangled in turn four. McRee dropped out of the race with ignition troubles during the caution, and Herrington pulled up in the third spot alongside Herndon for the restart. When the field went green on a lap 22 restart, Herndon got busy challenging Johnson for the lead. Herndon pulled alongside Johnson on lap 23, and he was able to get the bite he needed coming off the fourth turn to take the lead. Once Herndon grabbed the point, he was able to pull away from Johnson, who now had to hold off the challenges of Herrington in third. Herrington got by Johnson for second on a lap 23 restart. At the halfway point in the race the top ten was Herndon, Herrington, Johnson, Stalnaker, Hughes, Livingood, Turvin, Love, Chris Lovett of Brunswick, GA in the Sterling Wild Game Special, and Reid. Herrington was working up on the top shelf of the race track, and he began to reel in the leader Herndon. Brian Wooten of Brunswick, GA in the Chancey Industrial Special stalled in turn two to bring out the 11th caution flag of the race. Herndon lined up for the restart with Herrington, Johnson, Stalnaker, Hughes, Livingood, Turvin, Love, Lovett, and Floyd doubled up behind him in second through tenth respectively. Johnson was able to retake the second spot from Herrington on the restart. As the pair battling for second entered turn one on lap 34, Herrington got into the back of Johnson and caused him to spin. The caution flag came out, Johnson restarted in second, and Herrington went to the tail of the field for the restart. While the top three settled into their spots after the restart, the rest of the field was still battling for position in two and three-wide battles. Herrington was working his way back through the field after restarting in the 20th spot. The local favorite got a big break on lap 45 when there was a multi-car tangle in turn one that brought out the caution flag. With many drivers going to the pits for repairs, Herrington found himself back in the top ten for the restart with six laps to go. When the green flag came out, Herndon pulled away from Johnson, and Johnson pulled away from Stalnaker. The war for positions continued behind the top three drivers, as Love and Herrington got back into the top five by the end of the race. 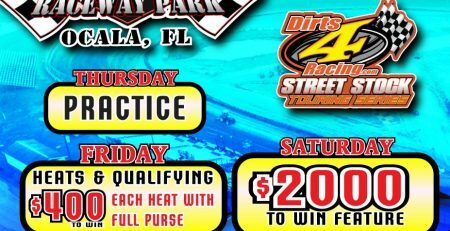 The next big show for the Durrence Layne Performance Parts Street Stock Division will be the $2,000-to-win Sunshine State Challenge at Bubba Raceway Park in Ocala, FL on March 1 and 2. The race will also feature the Dirts 4 Racing Street Stock Series. 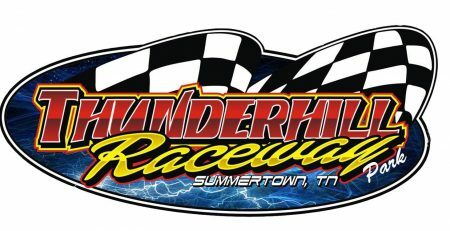 That will be a part of the $10,000-to-win Chevrolet Performance World Championship Weekend for the Durrence Layne Chevrolet Dirt Late Model Series. For more information and rules about the Durrence Layne Performance Parts Street Stock Division, visit the series web site at www.durrencelayneracing.com, or visit the series on Facebook at Durrence Layne Performance Parts Street Stock Division. You can follow us on Twitter @DurrenceLayneRacing. 1ST HEAT: 1. Johnson; 2. Love; 3. McRee; 4. Stalnaker; 5. Watkins; 6. Wooten; 7. Floyd; 8. Giddens; 9. Reid; 10. Ward. 2ND HEAT: 1. Herndon; 2. Hughes; 3. Turvin; 4. Gentry; 5. Washam; 6. Chancey; 7. Tuten; 8. Lane; 9. Williams; 10. Cody DNS. 3RD HEAT: 1. Herrington; 2. Fortner; 3. Livingood; 4. Greene; 5. Stokes; 6. Price; 7. Lovett; 8. Flowers; 9. Bailey. B-MAIN (10 Laps – Top 6 Transfer To Main Event): 1. Tuten; 2. Giddens; 3. Lovett; 4. Lane; 5. Floyd; 6. Reid; 7. Williams; 8. Bailey; 9. Flowers; 10. Ward DNS; 11. Cody DNS. Durrence Layne Performance Parts at Durrence Layne Chevrolet, Buick, GMC of Claxton, GA is the Title Sponsor of the Durrence Layne Performance Parts Street Stock Division. 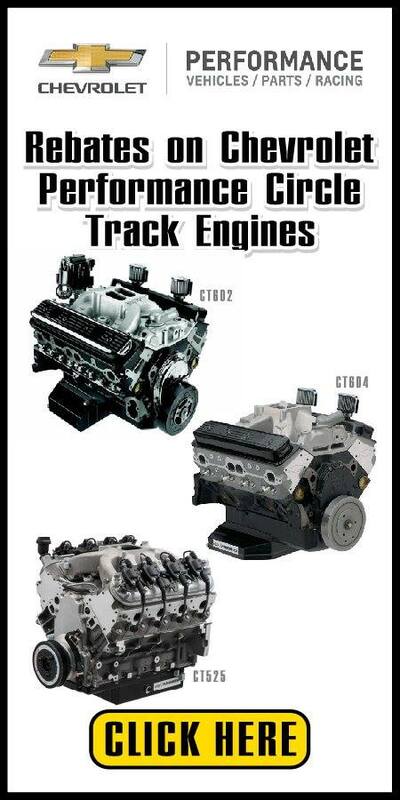 Durrence Layne Chevrolet, Buick, GMC is one of the Nation’s Top GM Powertrain and Performance Dealers, with free delivery anywhere in the Southeast. 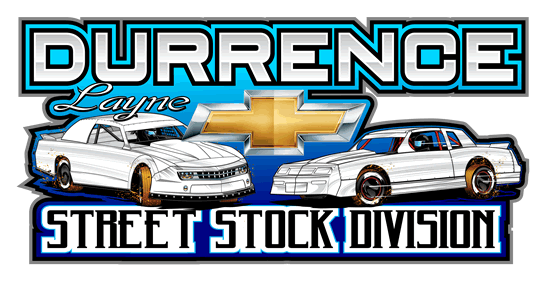 Chevrolet Performance Parts is an Official Sponsor of the Durrence Layne Performance Parts Street Stock Division. Hoosier Racing Tire is the Official Tire Sponsor of the Durrence Layne Performance Parts Street Stock Division. VP Racing Fuels and Lubricants is the Official Race Fuel and Lubricant of the Durrence Layne Performance Street Stock Division. Fullmoon Graphics is also an Official Sponsor of the Durrence Layne Performance Parts Street Stock Division.